The City of Conway released the results of the Roundabout Community Survey and Roundabout Feasibility Study on Wednesday. Results will be presented to the Conway City Council on Tuesday, May 14. There are many factors to consider in determining the order in which to improve the studied intersections that would have the greatest net positive impact on the road users. The available data did not present a case that any of the intersections pose a significant safety risk. The planned roundabout at the intersection of College Avenue and Donaghey Avenue will assuredly allow westbound traffic to reach the intersection of College Ave/Farris Rd in higher volumes than today. As such the improvements to delay by converting College Ave/ Farris Rd to a roundabout will likely be greater than the improvements to delay in current conditions. With 28 crashes in the, the College Ave/ Farris Rd intersections ranks at the top of the studied intersections. While the intersection is constrained on the southwest corner by the doctor’s office parking lot, there appears to be adequate room to construct a roundabout in this location. Constructing a roundabout in this location will greatly benefit the City by improving delay, safety, and adequately accommodating the for future traffic. Since the intersection of Irby Drive and Salem Road meets Warrant 1 and 2 for signalized control some type of improvement is necessary. The available ROW and lack of major utility conflicts make this location ideal for a roundabout. The high number of left turns from Irby Dr increase the safety benefits provided by a roundabout as right-angle collisions are rare in roundabouts. Improving the intersection of Irby Dr/ Salem Rd will produce great benefits for the road users. The intersection of Prince St/ Country Club Rd narrowly ranked second in terms of delay improvements in the design. School traffic from an elementary school located just north of this intersection will benefit from the installation of a roundabout here. The construction of a roundabout at Prince St/Country Club Rd will complete the Prince Street roundabout corridor thus increasing the overall benefit constructing a roundabout in this location. The intersection of Salem Rd/Tyler St poses concern regarding the ROW constraints in order to construct an adequately sized roundabout for the current and projected traffic volumes. There are a significant number of drivers turning left from Tyler St to go northbound on Salem Rd. The heavy volumes southbound on Salem Rd during the AM peak cause this intersection to be unbalanced which adds to the complexity of constructing a roundabout at this location. While this location does experience significant delay, optimizing the signal timing may prove beneficial. The improvement to the intersection of Irby Dr/ Salem Rd will likely provide an alternate route for many of the drivers using Tyler St/ Salem road from the west approach. Due to the expected cost and complexity of constructing a roundabout at this location, it will likely not provide as much benefit compared to other intersections in this study. 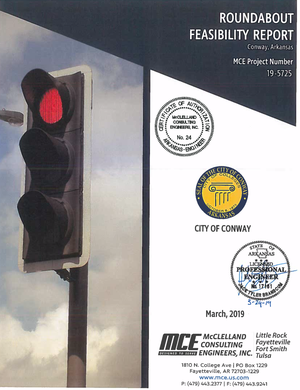 Due to proper planning by the City of Conway regarding development around the intersection of Prince Street and Hogan Lane, there exists adequate room to construct a roundabout. However, the delay improvements to this isolated intersection are not as great as other intersections and optimizing the existing signals timing plan may prove to provide an acceptable LOS. College Avenue and Prince Street showed to have the lowest number of crashes of the studied intersections and provide the least amount of improvement to delay of the existing signals. If drivers are experiencing. 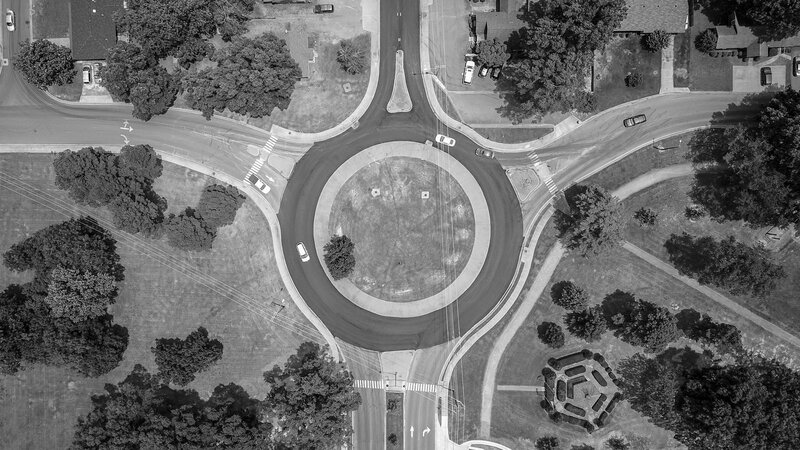 While adequate space is available to construct roundabouts and would improve the performance of the intersections, the overall benefit to the drivers is not as great at this location. A comment section was also provided as part of the survey. To summarize the main concerns, the left turn from Irby Drive is perceived to be exceptionally dangerous during peak hour conditions. There were many requests for roundabouts along Dave Ward Drive (AR 60), Oak Street (AR 64), and Harkrider Street (AR 65). And many complaints on the timing of the signalized intersections.